The Sony Xperia Z5 and Xperia Z4 Android 6.0 Marshmallow update roll out is right around, or at least that's what sings are suggesting. Both smartphones have been spotted in WiFi Alliance database pending approval for the Marshmallow update. All WiFi compatible devices must get a an interoperability certificate from WiFi Alliance, which is a non-profit organization that promotes Wi-Fi technology and certifies Wi-Fi products. 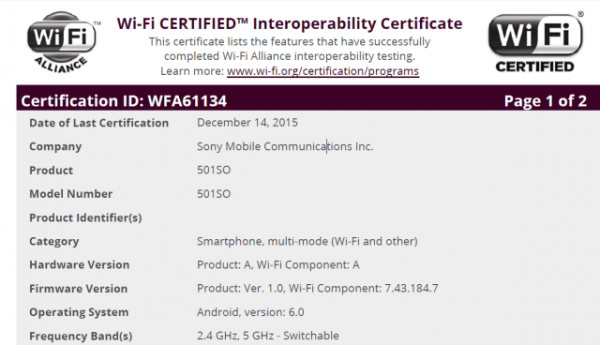 The guys at Xperiablog have spotted the bellow screenshot on a Japanese blog which reveals that both the Xperia Z5 and Xperia Z4 running Android 6.0 have received the certification. However, it may take several weeks until the actual update is being released for the public. The Android 6.0 Marshmallow update got certified for several Japanese variants of the Xperia Z5 and Xperia Z4. The Xperia Z5 models that received the certification are NTT docomo (SO-01H), SoftBank (501SO) and au (SOV32), while the Xperia Z4 models are NTT docomo (SO-03G), SoftBank (402SO) and au (SOV31). It's also worth noting that NTT docomo Xperia Z5 Premium (SO-03H) went through the same process too. Sony revealed that many of their 2014 and 2015 smartphones will get upgraded with Marshmallow. All the Z5 and Z4 (for Japan only) variants will be updated with the latest Android versions, along with the Xperia Z3+, Z3, Z3 Compact, Z3 Tablet Compact, Z2, Z2 Tablet, M5, C5 Ultra, M4 Aqua, and C4. As you may already know, the Android 6.0 Marshmallow update is not as major as the transition from KitKat to Lollipop, but it still arrives with quite a few changes and improvements. It brings improved security courtesy of the new granular app permissions system, interface and functionality tweaks for Phone and Contacts app, Google Now On Tap for contextual information of what's on the screen, customizable Quick Settings area and status bar, updated Do Not Disturb Mode with custom rules, Doze Mode for improved battery life while in stand by, and many other such goodies.